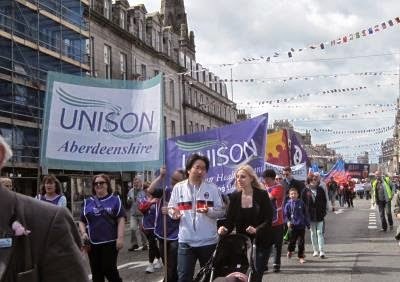 The banners and flags of dozens of trades unions and community groups made a colourful display as Aberdeenshire UNISON joined hundreds of marchers as they snaked down Union Street in Aberdeen to celebrate International Workers Day, and to call for solidarity across borders. Shoppers again stopped to watch and wave, as the Guarana Drummers led the march from the West End to a rally at the Castlegate. 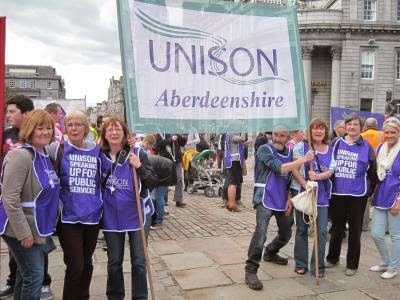 Here, speakers spoke passionately against the austerity measures of this UK Government which have hit ordinary people the hardest with cuts to welfare and poverty pay whilst the richest increase their wealth by £190 billion.